An amazing story in China! A set of twins who arrived an unbelievable 18 weeks early are set to be released from a hospital in central Taiwan’s Taichung City where they were born five months ago. Pediatrician Lin Hung-chih at the Children’s Medical Center of China Medical University Hospital said that the baby girl weighed only 500 grams when delivered, while her brother weighed 550g. After treatment, the twins have grown to 2,065g and 2,375g respectively and could be released as early as next week. 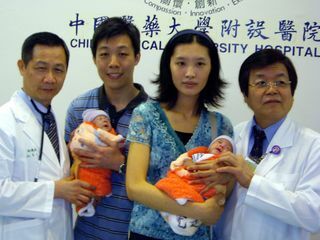 Dr. Lin said he had searched domestic and foreign medical documents and reports for information about similar cases, but found no records of twins surviving if born before six months old. The survival rate of a pair of 22-week-old premature twins is virtually nil as there are only a handful of babies that have survived arriving at this gestation. Additionally, most hospitals don’t resuscitate babies who arrive before 23.5 – 24 weeks. These babies probably had a better chance of survival because they arrived weighing much more than a baby that is born at 22 weeks. Report: TWINS For The Travoltas!